Stunning example of the OWNER'S AFT version with head en suite, two cabins fwd with private heads.Davits accommodate Rib & OB. Complete custom canvas package with side/aft grab rails. Upgraded 110 Yanmar and 9KW Northern Lights. All Raymarine instruments. Elec heads. 3 electric winches. Ice-maker and microwave. SS cap on top of teak rub rail. Magnum inverter charger. Bow thurster. Rthernet cord for chartplotter to Nav; Raymarine software RNS 6.2 w/ethernet. TV in salon + antenna at mast head. Abundance of stowage thruout the yacht. 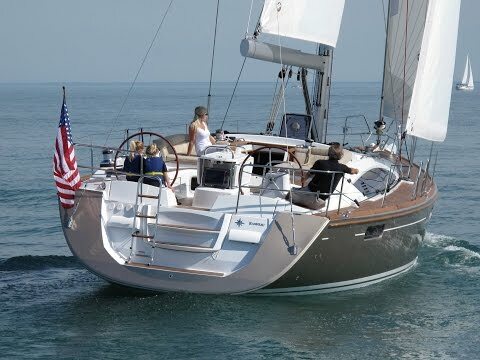 This beautifully finished, extremely well built yacht is a sailors dream. Fast, high interior volume with shoal draft. Full boat AC with reverse heat. Sold new and commissioned by ACY. Joel Dionne Yachts is pleased to assist you in the purchase of this vessel. This boat is centrally listed by Atlantic Cruising Yachts.